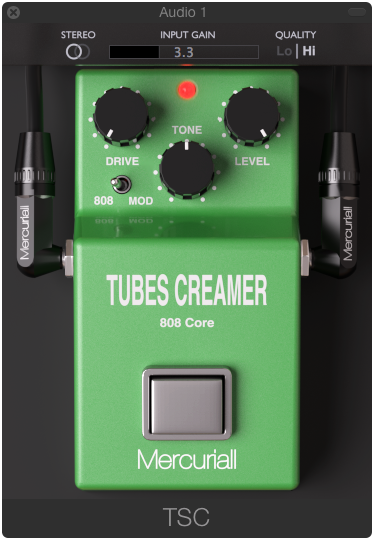 Tubes Creamer 808 Core Free Vst by Mercuriall Guitar Effect distortion Ibanez Ts-808. Mercuriall Audio Software has released Tubes Creamer 808 Core, a new free audio plug-in for Mac OS X and Windows in AU, VST and AAX plugin formats. Stompbox guitar effect free vst plugin. The modeling is based on a real circuit of the Ibanez TS-808. Mod switch: “808” for a default sound of the Ibanez TS-808 and “Mod” for getting a cleaner sound with slightly more bass when “Drive” is at the minimum. Low (no oversampling) and High (4x oversampling) Quality switch.